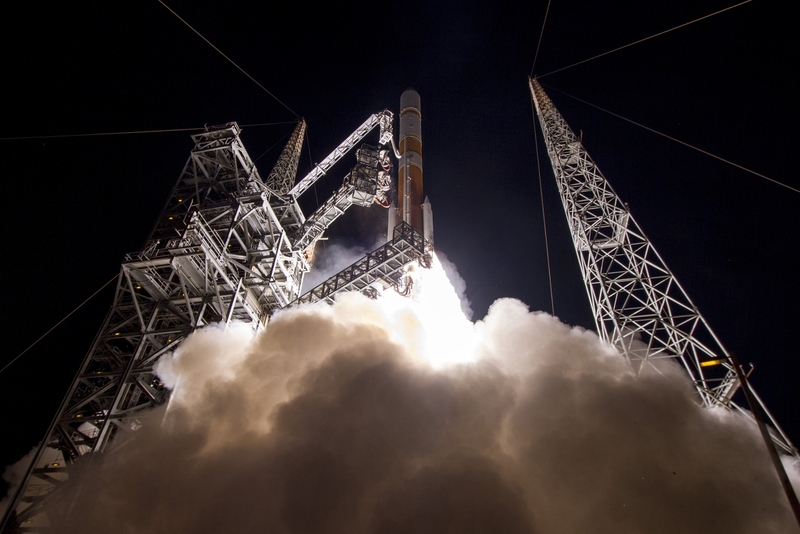 CAPE CANAVERAL, Fla. — After a number of postponements, and a technical glitch at T-minus 4 minutes, United Launch Alliance’s (ULA) Delta IV Medium+ (5,4) rocket finally got off the ground with the Department of Defense’s ninth Wideband Global SATCOM satellite (WGS-9). The launch took place just after twilight at 8:18 p.m. EDT March 18 (00:18 GMT March 19), 2017, from Space Launch Complex 37. The weather for the launch of the Delta IV Medium+ (5,4) configuration Evolved Expendable Launch Vehicle (EELV) was all but perfect. The only concerns Cape Canaveral Air Force Station’s 45th Weather Squadron had was the potential of cumulus clouds; however, those never materialized. The Mobile Service Tower (MST), which is used to allow workers to work on the fully-stacked Delta IV, was rolled back at 11:39 a.m. EDT (15:39 GMT). With the hum of engines straining to move the structure back a full football field’s distance (roughly 160 feet or 49 meters) the orange and white rocket was exposed to the clear blue skies of the Sunshine State. Brig. Gen. Wayne Monteith, 45th Space Wing commander and mission Launch Decision Authority, said that this was the fourth major launch operation on the Eastern Range and the second successful launch in just two-and-a-half days, culminating many long hours of hard work by the entire mission team. 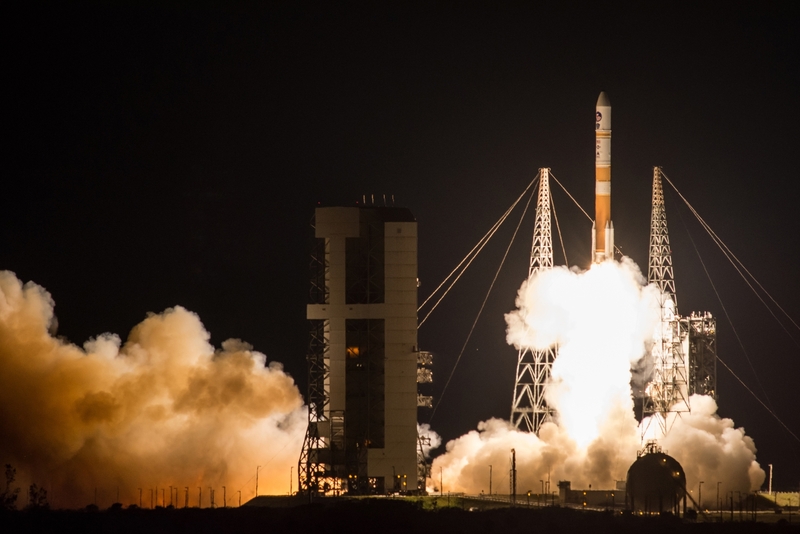 The launch was postponed several times for various reasons including, on March 4, when the liftoff date for WGS-9 was changed to March 14 after the ULA team discovered an issue with the Delta IV first stage booster during standard prelaunch inspections. Later, on March 11, ULA announced that the launch would be no earlier than March 17, stating Eastern Range availability as the reason. This was further delayed by 24 hours due to launch schedule conflicts. At ignition, the free hydrogen drifting around the RS-68A Common Booster Core (CBC) engine blossomed into an impressive but harmless cloud of flame. Then, when the countdown clock reached zero, the four solid rocket motors (SRMs) ignited and began to rise off the pad, lighting up the Florida sky. 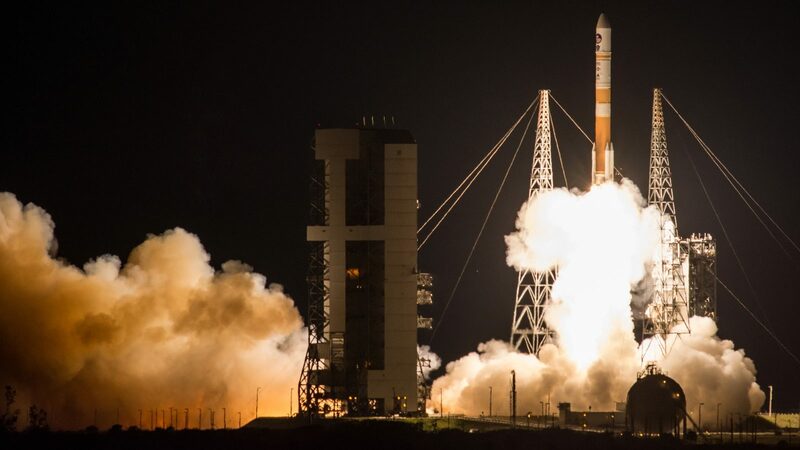 While the Department of Defense and ULA are not advertising the mass nor orbit of the WGS constellation, it is known that the ten spacecraft approach geosynchronous orbit and that the Delta IV Medium+ (5,4) can lift up to 15,074 pounds (7,020 kilograms). The SRMs burned out and were jettisoned in pairs: one set a minute and 40 seconds into flight, the second set two seconds later. Up above the bulk of the atmosphere, Delta IV’s payload fairing jettisoned at T+3 minutes, 14 seconds. The first stage depleted its propellants at just past T+4 minutes, with the Delta Cryogenic Second Stage (DCSS) igniting 13 seconds later and firing for a bit over 15-and-a-half minutes. The DCSS performed a second three-minute burn to send WGS-9 on its way to its final orbit before burning a third time to go into a deorbit burn. 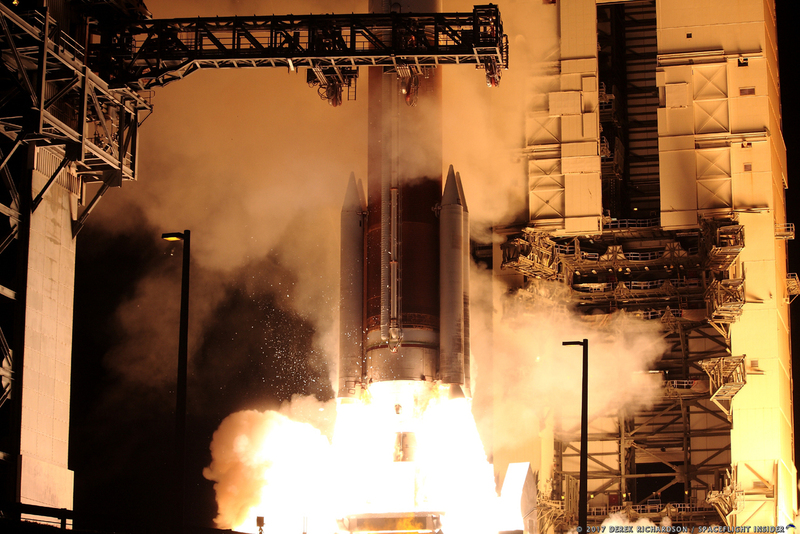 This was the seventh launch of the Delta IV Medium+ (5,4), which comprises a five-meter-diameter payload fairing and four strap-on SRMs – each SRM providing 281,000 lbf (1,250 kN) of thrust – that are used during the first-stage liftoff. This vehicle configuration has been used only to launch WGS satellites. The CBC is powered by an RS-68A liquid hydrogen / liquid oxygen engine producing 705,250 lbf (3,137 kN) of thrust at sea level. A single RL10B-2 liquid hydrogen / liquid oxygen engine powers the second stage. Aerojet Rocketdyne manufactures both the booster and DCSS engines. As Kolomiets noted, ULA assembles the Delta IV Medium+ (5,4) launch vehicle in Decatur, Alabama. This is ULA’s 3rd rocket launch of 2017 and the 118th successful flight since the corporation was formed in December 2006. The Department of Defense (DoD) has not announced the next launch in the constellation, but WGS-10 is scheduled to be the last spacecraft in the series. Presumably, that launch will use the 5,4 configuration as well. Representatives with Boeing have told SpaceFlight Insider that the final spacecraft should launch in 2018. The WGS constellation is able to support broadcast, multicast, and point-to-point communications. It is also the only military satellite communications system that can support simultaneous X-band and Ka-band communications. The system shares data in real time for tactical communications and supports a wide variety of missions, from search and rescue efforts to military operations. WGS is an international effort, one which works with several nations to help improve global security. Go ULA, Go USAF, Vigilance!